Erin Johnson is an attorney in the business & commercial litigation practice group in Dykema’s Chicago office. Ms. Johnson’s practice includes litigation in Illinois and Indiana’s federal and state courts defending businesses against individual and class action lawsuits arising ADA, ADEA, as well as contractual disputes. Ms. Johnson also defends financial services providers against individual claims brought pursuant to RESPA and TILA. 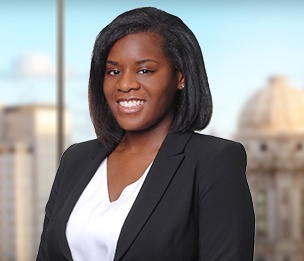 Ms. Johnson is a member of the firm’s Privacy and Data Security team and the BIPA Litigation and Response Team (“Illinois Biometric Information Privacy Act”) in which she assists in advising clients in the areas of data breach response and domestic and international data privacy law compliance projects. Ms. Johnson actively participates in pro bono work and has served as a Guardian ad Litem. In law school, Ms. Johnson served on the Executive Board of the Christian Law Student Association and the Black Law Student Association. She also served as President of the Education Law and Policy Society and worked as a student attorney in the University of Illinois Domestic Violence Clinic, where she assisted survivors in obtaining orders of protection. Additionally, Ms. Johnson completed an externship with Judge David B. Atkins in the Chancery Division of the Circuit Court of Cook County. Prior to law school, Ms. Johnson served with City Year Chicago.